i just finished reading an article posted here that hamas used children to build their tunnels and 160 of them died. used children. since israel has better wepons what does that say for hamas's respect for human life. they have started something they cannot win. also when israel is going to bomb someting they put out a warning to get out. they do not go. i think these people want to die. there is so much this article does not say. it is the children dieing that gets to me the most. on both sides. 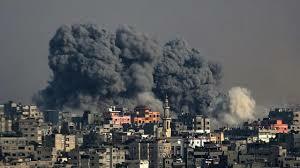 if hamas cared about their people they would not have started this. also i do not believe israelis decapitated anyone. it was probably done by the enemy just to blame them. Thank Carrie. Although almost all media here in the Netherlands are trying to show both sides of the story and give both sides room to make their case, they stay away from propaganda and these five points weren't in need of debunking for me. But then we have no 'news' channels like Fox News who are the talking heads for the Right Wing and need no war to have the Truth fall victim first. It is good to see that media like Alternet tries to bring some balance in the covering of the news which comes out of Israel and it commendable that you are willing to post it on Care2 for that much needed balance. Okay, I see 5 talking points but how are they debunked? There's no proof offered, no facts, just a nicely embroidered, rambling personal opinion. I give it one popcorn bag for the really nice SafeAuto advert. Lona, the pro-Israeli propaganda articles carpeting Care2 really are getting out of hand, aren't they? Yes Barbara, I'm sure seeing the truth finally come out about Israel is quite distressing for you because you are finally going to have to end your pity party which started when the world learned of the Nazi atrocities. It would seem Israel learned all the wrong lessons of the Holocaust. Doing onto others what was done to them is not acceptable behavior. Israel is inching ever closer to actions and behavior which will condemn them forever in the eyes of mankind. Wow!! I don't what profession you're in, but you'd make an astounding political analyzer. Interesting, two takes on the same story and how it will end. It will end the way it is meant to end. My heart goes out to all the suffering children and adults. Noted. Thanks for posting, Carrie. MSM is using these five talking points, tho' some are more blatant than others. Am increasingly grateful for alternative news outlets, now more than ever. Funny, I didn't see a single fact that debunked anything. One side has a published manifesto that calls for the genocide of the Jewish people. The other has no such thing, has members of their government that have been elected democratically from the Palestinian people. Does NOT indoctrinate their children into thinking that the Palestinians must die, and certainly did not kill 160 of their own children to build tunnels for the sole purpose of killing civilians. Some people have a very skewed sense of priorities, and right and wrong.